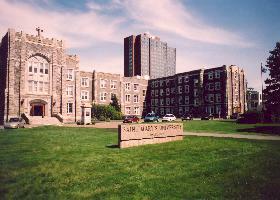 Saint Mary's University is located in the south end of Halifax peninsula, and is surrounded by a variety of sources of light pollution, including the University itself. 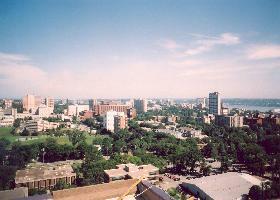 The Burke-Gaffney Observatory (BGO) is located on the 24th story of the 22-story Loyola Residence, identified by the arrow (above left), and dominates most views of campus. 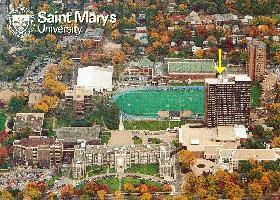 The scene (above right) shows the dome for the 0.4-m telescope atop the Loyola Residence, behind the McNally Building, where the offices of the Department of Astronomy and Physics are located. 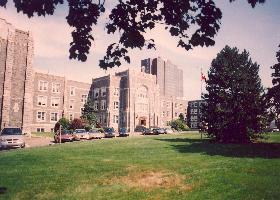 The tree branches in the picture were lost during Hurricane Juan in the morning hours of September 29, 2003. 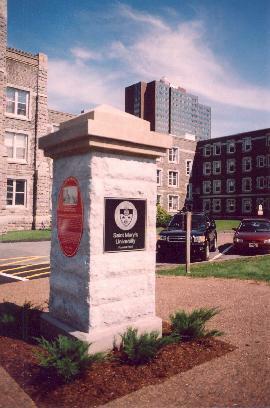 The present view (above left) also includes a commemorative plaque (above right) erected during the University's 200th anniversary celebrations in 2002-2003. 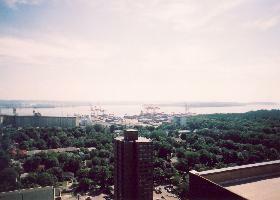 The vista from the roof of the Loyola Residence, overlooking Halifax (above left) and the approaches to Halifax Harbour (above right), is quite breathtaking. 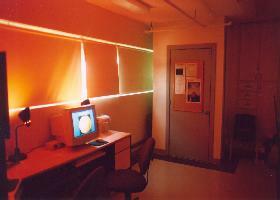 The warm room of the BGO contains control consoles operating Dave Lane's Earth-Centered Universe (above left) and the door to the telescope dome (above right). 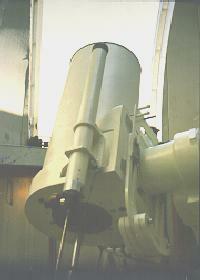 The telescope (above left, old color scheme, center, new color scheme) is a reflector containing a 0.4-m diameter mirror. 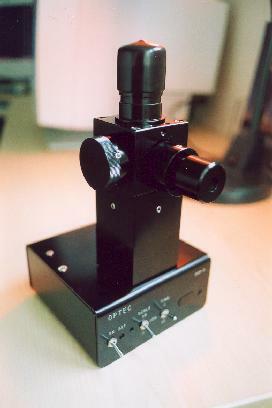 It can be used with CCD cameras or an Optec SSP-3 photometer (above right). The advent of CCD detectors for astronomical imaging has made it possible to initiate observational research projects from the Saint Mary's campus. 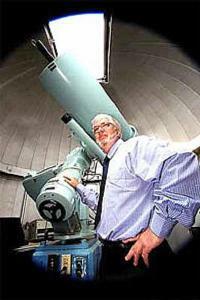 Since summer 1996 the telescope has been used by undergraduate specialists for summer observing of Cepheids and other variable stars. 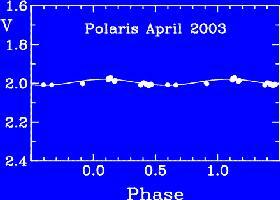 The light curve for the 4.5-day Cepheid XY Cas (above left) was obtained by Stephen Goobie from observations obtained during summer 1998. 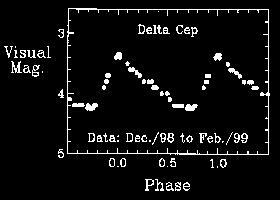 The light curve for the 5-day Cepheid d Cephei (above right) was obtained by me from unaided observations made from my backyard between December 5, 1998, and February 16, 1999. The purpose of such observations lies in establishing current times for light maxima of such stars, since differences from established ephemerides can be used to study their period changes. Even for d Cephei, the times for light maxima are now coming about two hours earlier than indicated by the Observer's Handbook. 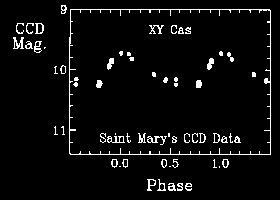 Both XY Cas and d Cephei have decreasing periods as a result of the gradual reduction in their overall dimensions as they evolve. Both are massive supergiant stars that have completed the hydrogen-burning phase of their evolution. 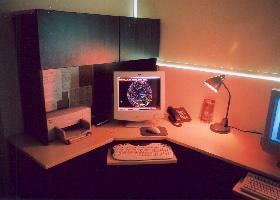 The low amplitude Cepheid Polaris is presently being monitored using the Optec SSP-3 photometer. 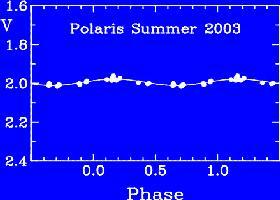 The star continues to undergo light variations (above), despite a suggestion made by Fernie, Kamper, and Seager (ApJ, 416, 820, 1993) that it might cease to pulsate before the end of the last millennium. 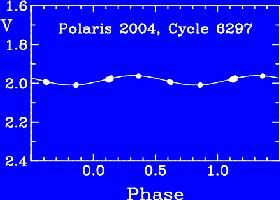 Our most recent observations are from Cycle 6299, Sept. 12-15, 2004.